Time for our monthly newsletter. 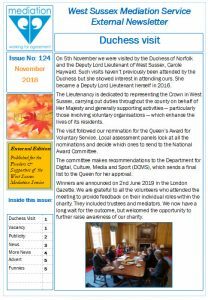 In this edition we highlight the visit of the Duchess of Norfolk to our offices, various other news items, including an imminent staff change and a word from one of our trustees who is seeking help in elevating the profile of the charity, across the county. If you feel that you may be able to contribute to that, in any small way, we would love to hear from you. Click here or on the image below to view the newsletter.